Where’s Drax? Well, he is finally here! A figure that some feared would never see the light of day has been released and is in the wild, and he does not disappoint! 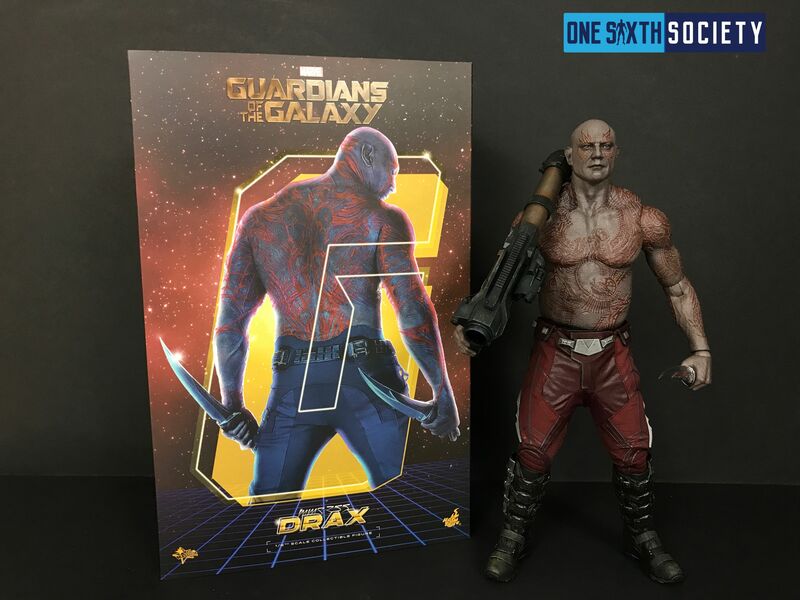 Coming with a fair amount of accessories and some unique sculptural details, Drax is a welcome addition alongside his team of a-holes, and we’re happy to have the worlds first Hot Toys Drax Review. It was quite a path to this point, with figures from the film’s sequel being announced before Drax from the first film was even released. There were swirling rumors of the reasons behind the delays, but regardless of what the reason was I think it is fair to say better late than never. With that being said, let’s dive right into everyone’s favorite alien badass: Drax the Destroyer. 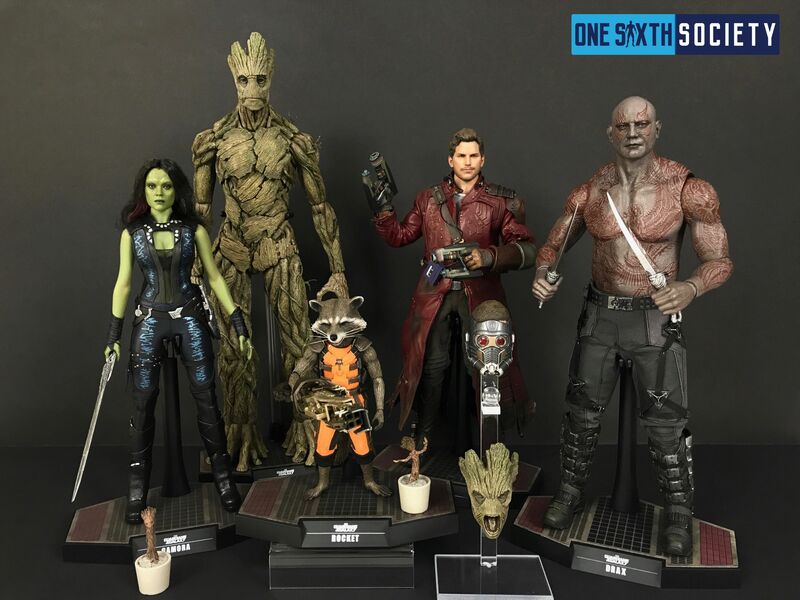 We star off our Hot Toys Drax Review with the packaging, we have a continuation of the packaging theme of the other Guardians of the Galaxy figures. A clean neon 80’s aesthetic with visually striking colors is a lovely addition to the figure, but we need to see the figure! 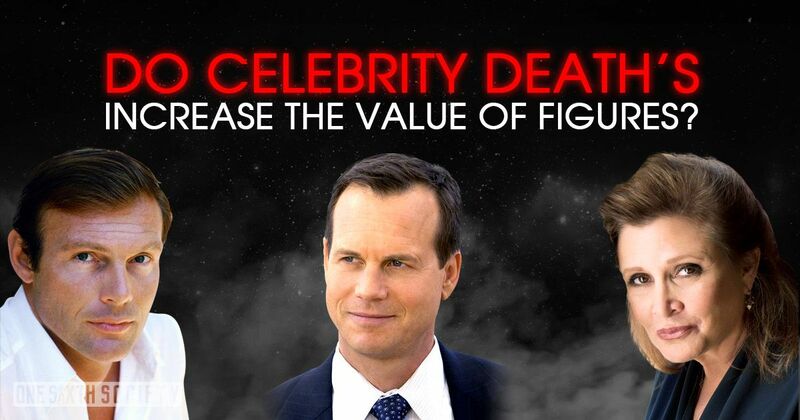 Right off the bat, the feature of the figure that immediately jumps out is the intricate sculpt of the body. 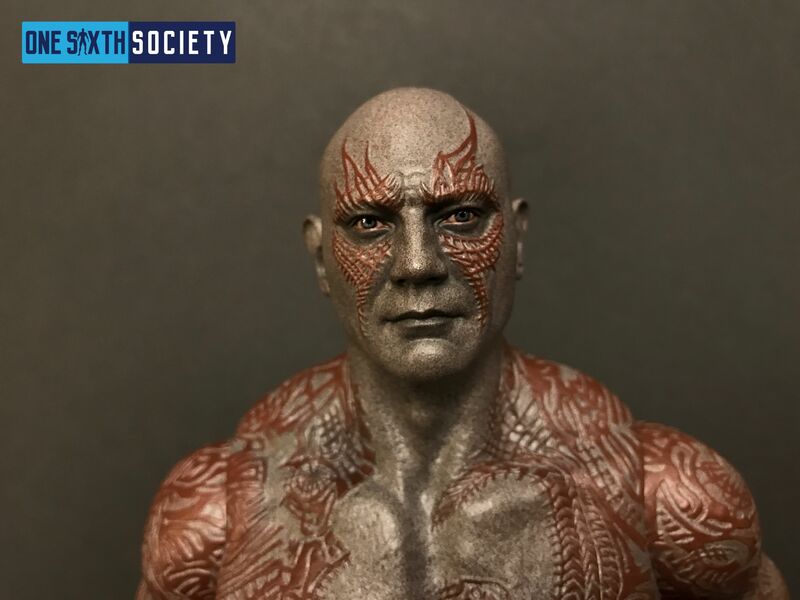 Drax’s tattoos are the most visually striking part of his character, and Hot Toys has reproduced the details immaculately. Not only is the sculptural work perfect, but the paint is equally impressive. Another note is that Hot Toys strayed away from the seamless body in favor of a plastic body with visible joints. This seems to be the safer decision, as seamless bodies have been known to degrade over time. 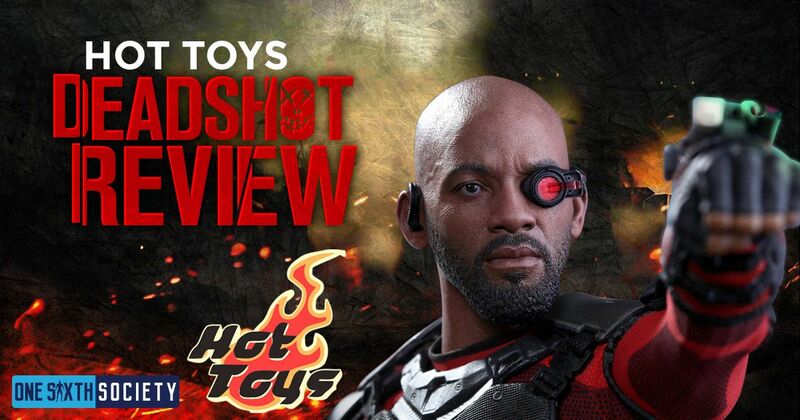 His posing is relatively standard, with the legs being hindered by his pants, but other than that it is everything you can expect from a Hot Toys body. The nature of the body’s material also seems like it will be safe from paint rub during posing as well, so overall the body is a slam dunk. Onto the accessories, they are somewhat limited but what we do get is pretty great. We are given Drax’s two blades. They are indeed plastic, but the paintwork, as well as the sculpt work creates a convincing metal look. An accessory that is extremely impressive is Drax’s rocket launcher. The weapon is supposed to show signs of wear, and the paintwork that is supposed to convey metal is done very well. There is some paint that is supposed to be rusted metal, and it is very convincing. 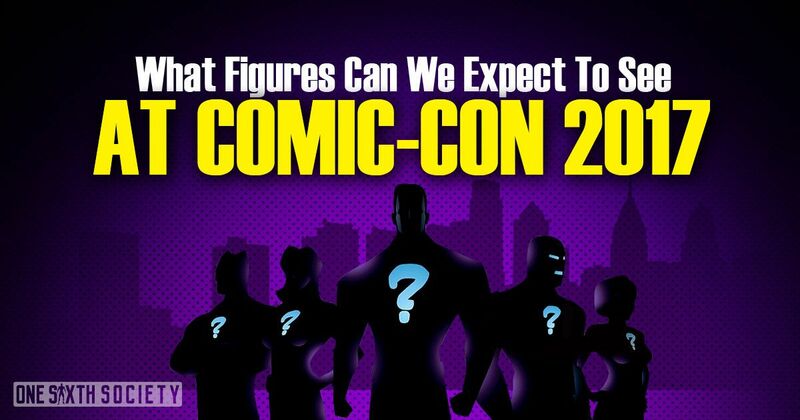 While Drax is character who is notoriously shirtless, so his only costume part would be his pants. 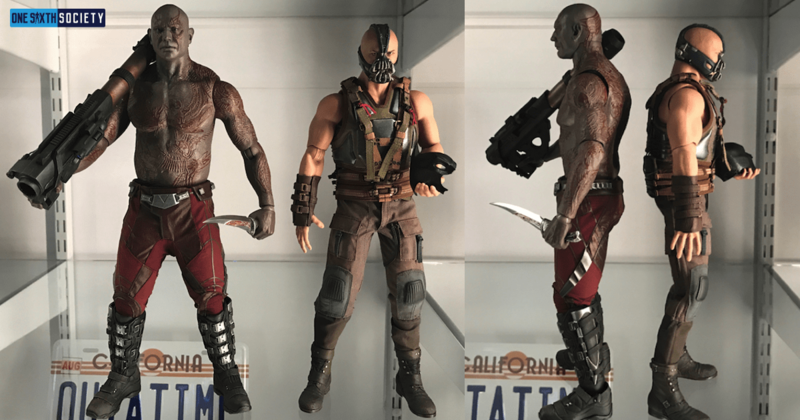 However, this release of Drax comes with two pairs of pants; his gray pants, as well as an interchangeable pair of red ravager pants. Some options are always nice, and Hot Toys certainly provided that for us.